Earlier this week, CoreLogic released its latest National Home Price Index, indicating continued price pressure in the country’s top 20 markets. A few weeks prior, CoreLogic also reported nearly half of the nation’s top 50 markets are overvalued. To many homebuyers, the “dream home” seems to take on a new meaning, as they compromise on their wish list in order to fit within their budget. Anecdotally, we have heard homebuyers are giving up commute time, extra outdoor space, or even privacy by means of taking on extra roommates in order to buy a home that doesn’t break the bank. In the latest ValueInsured Modern Homebuyer Survey conducted in the last week of October 2017, we asked interested homebuyers what they are least willing to give up in a new home. There are some interesting variations among different age groups in terms of what each in willing to give up. Among Millennial homebuyers, “access to better schools” is the third most important home attribute they are least willing to give up, behind only “a nicer home that needs less upgrade or renovation” and “a bigger home with more room or more space”. Homebuyers ages 50+ place a lower priority on access to better schools and a shorter commute to work, and are least willing to give up a nicer home and more outdoor space. Urban residents are less willing to give up access to better schools than their suburban and rural counterparts, whereas rural residents are less willing to give up a nicer outdoor area or more land. Suburban homebuyers are more likely to value a bigger home with more rooms or more space than their urban and rural homebuyers. 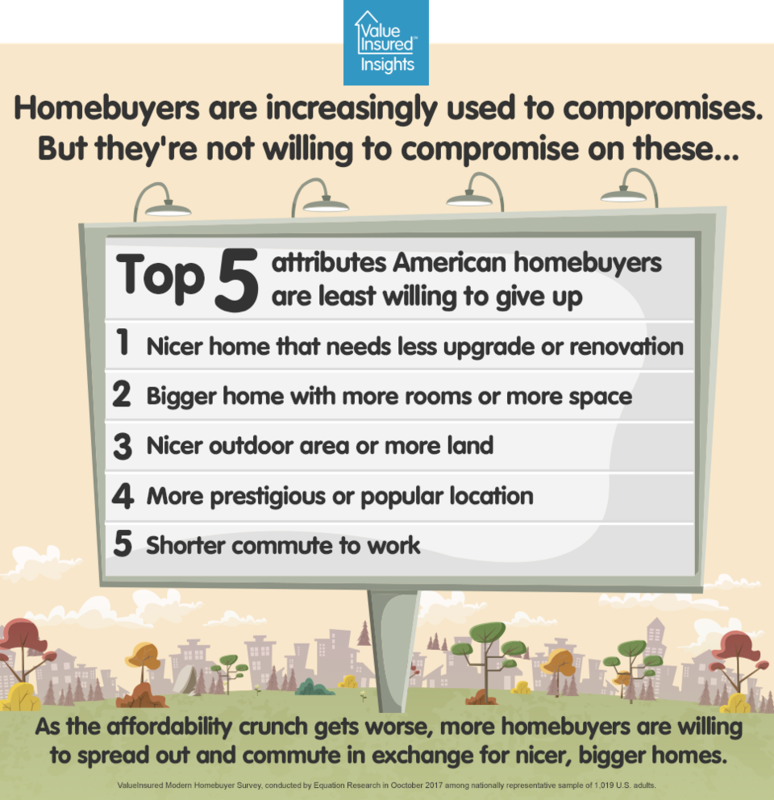 Not surprisingly, American homebuyers have a diverse priority list in terms of what they desire most in a home. However, there is consensus that at today’s home prices, all feel they need to give up something to order to get closer to homeownership.